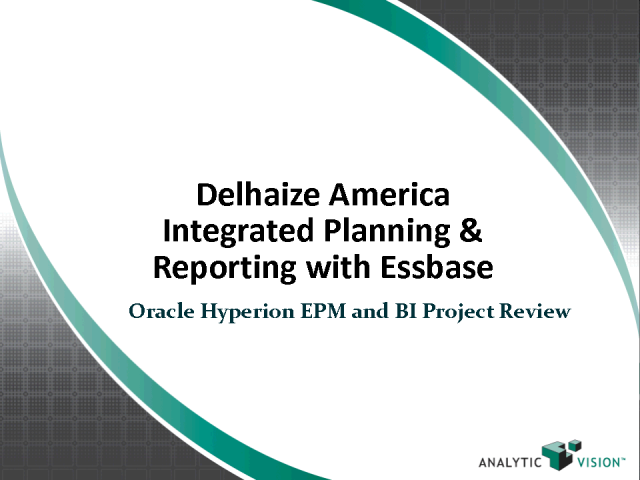 Some of the most widespread and important uses of Essbase and OBIEE are for integrated profitability analysis, financial reporting and analysis, and integrated planning and forecasting. In this customer case session, you’ll hear from John Loyack, Sr. Manager Financial Systems/Expense Payables at Food Lion (http://www.foodlion.com/) and Jason Little, Executive Partner at Analytic Vision (http://www.analyticvision.com/) on how Delhaize America and Food Lion leverage Essbase, OBIEE and Hyperion Planning for profitability, P&L analysis and integrated Planning. And, you will learn how they are designing, developing and implementing a driver-based financial planning solution utilizing Essbase across Delhaize America that will provide a highly efficient and an integrated planning solution for the Three-Year Plan, budget, and forecast cycles. Delhaize America is a leading supermarket operator in the United States with over 1 500 stores in 16 states in the eastern United States. Delhaize America operates under the banners Food Lion, Bloom, Bottom Dollar, Harveys, Hannaford Bros., and Sweetbay, each of which has a distinct strategy and a well-established brand image. Through its multiple banners, Delhaize America is able to target the needs and requirements of specific markets, customize its product and service offerings and maintain strong brand recognition with its local customers. Delhaize America employs approximately 109 000 full-time and part-time associates up and down the East. John Loyack, Sr. Manager Financial Systems/Expense Payables, Food Lion, LLC. Most companies today have too many BI tools. Specific use cases drove the adoption of specialized tools; in addition, BI vendors helped stoke this debate with arguments over architecture. The relational vs OLAP wars of the late 1990's were a time a strident debate. Today, with the release of Oracle BI 11g, companies today can leverage best-of-breed ROLAP and MOLAP engines as well as powerful 11g architecture to bring the metadata, query definition, user management, security and systems management. Come learn how Oracle BI Suite Enterprise Edition 11g and Oracle Essbase work better together to meet the modern BI needs of the enterprise. Some of the most widespread and important uses of Essbase are for integrated profitability analysis, financial reporting and analysis, and budgeting and forecasting. In this customer case session, you’ll hear from Jason Little, a partner at Analytic Vision, and Jim Piper, the Financial Systems Manager in Corporate Accounting at the Pantry, Inc. (http://www.thepantry.com/) on how they leveraged Essbase for profitability, cash flow and P&L analysis. And, you will learn how they designed and deployed a process to streamline the annual budget, simplify the allocation process, optimize the business rules and quarterly budgeting process, and enhanced financial reporting capabilities to the Pantry’s field and corporate executives. Headquartered in Cary, North Carolina, The Pantry, Inc. is the leading independently operated convenience store chain in the southeastern United States and one of the largest independently operated convenience store chains in the country. As of January 25, 2010, the Company operated 1,655 stores in eleven states under select banners, including Kangaroo Express®, its primary operating banner. The Pantry's stores offer a broad selection of merchandise, as well as gasoline and other ancillary services designed to appeal to the convenience needs of its customers. Jim Piper, Financial Systems Manager, Corporate Accounting, The Pantry, Inc. Accurate analysis of business operations is critical for companies to grow and succeed. In attempts to gain historical, current and predictive views of business operations, organizations can end up lost in a tangle of macros and thousands of static Excel workbooks, spreadsheets and interconnected tabs that take weeks to produce, and that don’t scale or respond to the changing environment. Join us for this Advanced Analytics Roundtable to learn how Essbase can enhance your organization’s BI strategy, and hear how customers are using its unique capabilities for applications such as management reporting, forecasting and profitability analysis. In today's increasingly competitive business environment, organizations need critical insights not only into what happened and what's happening in their business, but also what the future may hold. To succeed, you need to close the gap between strategy and operational execution. This webcast series will focus on how you can enhance your organization’s BI strategy using customer case studies and insights from industry leaders. Presented by: John Loyack, Sr. Manager Financial Systems/Expense Payables, Food Lion, LLC.